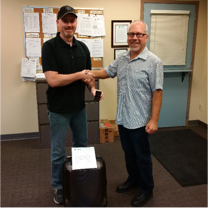 Dennis Clarke celebrated his 15 year anniversary with Landtran Logistics! After 3 years running the USA lower 48 with his wife Roxanne as a Hwy Driver for H&R Transport Dennis Joined us in June 8 2001 originally as a driver running in our USA fleet doing nightly runs to Oregon and/or Seattle areas. After 3 years of exemplary service and the birth of his daughter he wanted to retire from the USA driving position and work locally. A position opened up in dispatch and Dennis jumped at the chance to further his career and be home nightly to be with his family. In 2007 Dennis was promoted to Operations Manager, managing all Hwy and local operations from our Surrey offices; a position which he still holds today. Congratulations Dennis on your 15 year anniversary and we look forward to your next milestone with us!! !